Avestus Real Estate, developer of the successful residential project Modřanský Háj, has sold out 32 flats and four houses from the projects‘ latest completed phase that are ready for the new owners to move into in March 2018. For those who prefer peaceful, safe living close to nature, there will be more units available as part of the next phase of construction. In March 2018, the new residents will start moving into the 32 new flats in six apartment buildings, sized from 2+kk to 4+kk, and four family houses in the 5+1 layout. Each house and flat features garden and balcony or terrace. Buildings C offer flats with floor sizes up to 115 square metres, while Buildings E have flats with floor sizes up to 120 square metres with two indoor parking lots. The construction of the aforementioned units, representing the latest completed phase of Modřanský Háj, started in the summer of 2016 and were sold out even before receiving their occupancy permits in March 2017. Modřanský Háj is one of the fastest growing residential projects in Prague. Its popularity is attributed to the premium location in the immediate vicinity of nature and easy accessibility to Prague city centre. It offers a calm and safe environment for families and a variety of sports facilities. A unique combination of timeless architecture surrounded by the greenery of private gardens and the woods of Modřanská Rokle creates an almost rural-like atmosphere that has long been popular with clients. “It turns out that our residential project meets the current housing trends. People seem to be very interested in living in such quiet and safe areas that also provide adequate amenities. Modřanský Háj offers a combination of quality, comfort and unique location that lures many new home buyers. 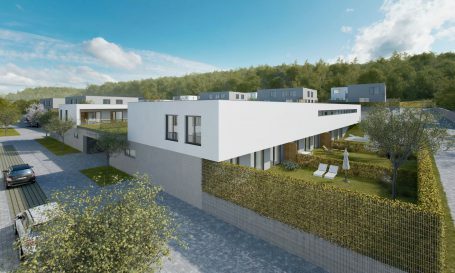 That is why the 36 new units that are now ready to move into have been sold out since March 2017, which makes us very happy,” said David Kříž, Residential Development Manager of Avestus Real Estate. Modřanský Háj’s expansion continues apace. The next construction phase, starting in spring 2018, will consist of 134 new units ranging from 1+kk to 4+kk in Buildings A, C, D and E. Flats, now available at prices starting from 3,900,000 CZK, will feature balconies or terraces, and some with gardens or roof gardens. Parking space in underground garages can also be purchased. 282 square metres, with a large garden, terrace and two parking spaces in the garage at a price starting from approximately 18,810,000 CZK. For those interested in tailor-made living, 17 plots with complete infrastructure are available for custom construction on land ranging from 767 to 1,906 square metres. Prices start at just above 8,820,000 CZK. Construction of 16 family houses, which will be available to their new owners by the end of 2018, is underway simultaneously. The construction of Modřanský Háj began in 2010 according to the design of A69-architekti s.r.o. studio. At present, there are 13 apartment buildings and two semi-detached villas. For more information, go to the website of Modřanský Háj www.modranskyhaj.cz where you can also access a virtual tour around the apartment building E.